President Muhammadu Buhari has returned to the country after his trip to the US and a “technical stopover” in London, UK. Buhari left the country on Saturday and headed to Washington DC where he met with President Donald Trump and some investors. He left the US on Tuesday but did not return to Nigeria until late on Thursday. 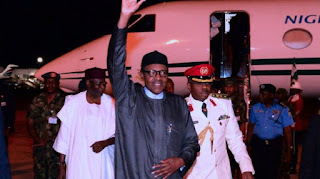 The presidential aircraft carrying the president and some members of his entourage landed at the presidential wing of the Nnamdi Azikiwe International Airport Abuja at about 10.35pm. Abba Kyari, chief of staff to the president, and Musa Bello, minister of the federal capital territory, were among those who received the president at the airport. Earlier on Thursday, Garba Shehu, spokesman of the president, said Buhari had a “technical stopover” in London. “I am sure if you keep your ears to the ground, you will hear of his arrival soon,” he had said. “The big jet is under repair. It has been taken for major repairs. So the President is using a small plane and there is a limit to the distance the small plane can cover. “So the technical stopover I talked about is that the journey from US to Abuja is broken into two. Technical stopover is that the plane stops at a point, refuel, do some checks and then proceed on the journey.